Floorworld is delighted to announce the launch of our new exciting carpet tile collections Fairview and Brooks. 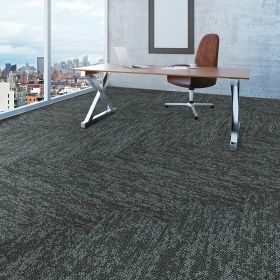 Available in eight stunning colors and in two sizes, plank size and squares, these modern designed carpet tiles add a dash of color and panache to even the most dullest of office spaces. Manufactured using 100% colorfast stain resistant polypropylene and having a PVC backing incorporating fiberglass as the middle layer to aid dimensional stability and combat expansion and contraction, with 7mm thickness and backed by the manufacturer CFlors of Canada's extensive 5 year warranty, these colorful hard wearing low cost carpet tiles are for those seeking a luxurious warm interior on a budget. 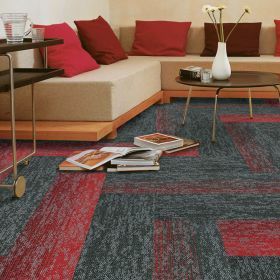 Easy to install and remove with no adhesives or damage to the subfloor, these squares and plank effect carpet tiles offer an endless combination of colorful floor designs to enable you to custom design your home or office. The Fairview and Brooks Collections are in stock and available to order today for immediate delivery and installation from Floorworld.com the biggest flooring company in the Middle East. Floorworld LLC is one of the leading carpet flooring suppliers in Dubai and the rest of the United Arab Emirates. 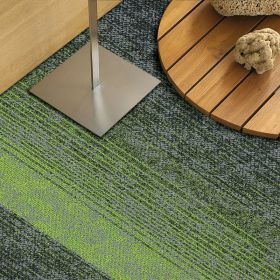 We supply an extensive range of carpet tiles suitable for commercial and residential use. As the foremost leader in the carpet tiles market in Dubai, we understand your needs; providing the best products that are durable and add a touch of beauty to your environment. Our carpet floorings are innovative, environment-friendly, high-quality and are designed to give you the exquisiteness you desire at cost-effective prices. Our carpet tiles are easy to use and are super easy to maintain. At Floorworld LLC, we are committed to offering our clients, including you, value for their money. For this reason, Floorworld LLC remains the most trusted and reliable supplier of carpet tiles in Dubai and the rest of the UAE. Carpet tiles are undoubtedly revolutionising the flooring industry. They are very easy to fit, are not a pain to maintain and last long too. Carpet tiles production involves a series of processes that begin with yarns tufted into the backing materials. A tufting machine with numerous needles then pushes loops of yarn through the backing material. Needles go through the backing to create a robust pile, holding it firmly. A dyeing process then occurs before the backing is squeezed and heated to solidify the shape. Our carpet collections are Fairview and Brook. 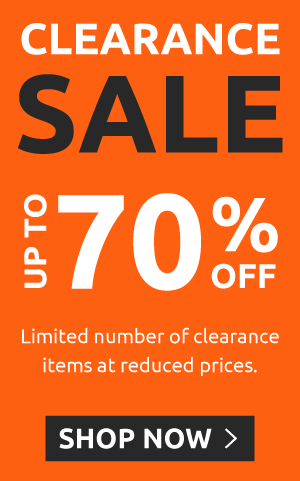 They are high-grade, stain-resistant polypropylene. A fibreglass-incorporated PVC backing is used as their middle layer for added stability and firmness. Thus, they can withstand the weight of people or heavy equipment and furniture sitting on their surface. They are available in eight stunning colours ranging from black to bronze to match your internal décor or brand. Our carpet floorings are 7 mm thick and backed by an extensive warranty from the manufacturer – CFlors of Canada – lasting for five years. For your carpet tiles needs in Dubai or the rest of the UAE, you won’t find a better supplier than Floorworld LLC. The constant referrals from our numerous clients are a testament to the quality of our products. For quality, beautiful carpet tiles in Dubai and the rest of the UAE, simply walk into one of our showrooms or stores. Our professional sales team are ever ready to offer you the best advice and answer whatever questions you might have. At 18% lower than the market price, you won’t get cheaper carpet tiles in the whole of Dubai and the UAE.